As the mountainous ribs of southern Siberia, the republic of Tuva breathes with a culture of inherent symbiosis. The expansive region rests at the true heart of Central Asia, brushed by the ancient carcass of the Sayan Mountains that rumble alongside the eastern steppe, the rigid Altai peaks that hover over winding plateaus to the west, and the Mongolian border to the south. At this intersection of Asian lands and traditionally semi-nomadic cultures, a legendary form of music continues to cultivate creative expression, spirituality, and, through adaptation, modern experimentation. The music of any region is the skin of its culture. Its texture, wrinkles, and colors stretch over flesh, bone, and spirit. Within the open palm of Central Asia, Tuva holds a musical tradition that has been quietly capturing the imagination of the world and which is among the most awe-inspiring vocal arts to have persisted to this day. Also known as overtone singing, and colloquially as khoomei, throat singing is a style of vocal performance that allows a singer to deliver two or more notes simultaneously, while the pitch is naturally controlled by the lips and throat. Overtone singing can be heard in many cultures: for instance, in some isolated regions in Canada’s Arctic; within the Xhosa communities of South Africa; among the Chukchi; and in the memory of the Ainu art of Rekuhkara. Tuva’s throat singing, however, is unlike any other in the world. – Tuva Online: Tuvan news articles in English and Russian. – The New Research of Tuva: A quarterly journal on cultural and historical studies of Tuva. – Tuvan National Orchestra: Official website. – Overtone Music Network: Great comprehensive site that includes personal profiles of artists—including Tuvan musicians listed—and many other resources for learning. – Genghis Blues: Documentary on Paul Pena’s journey to Tuva and Kongar-ol Ondar. – Where Rivers and Mountains Sing by Theodore Levin and Valentine Suzukei: Sound, Music, and Nomadism in Tuva and Beyond. – Tuva or Bust! 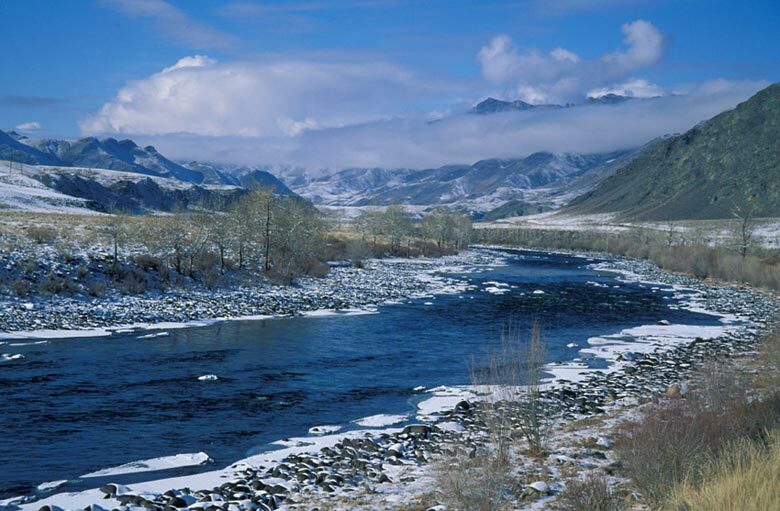 : Theoretical physicist Richard Feynman’s account of his determined voyage to Tuva. – Tuvan Trader: Buy Tuvan stuff online. – Siberian Shamans Come in From the Cold: Ken Hyder’s three-part report of his visit to Tuva and encounters with shamans. – Shamanism and Music in Siberia: Drum and Space: Ken Hyder’s essay, cited in this article. – Sainkho Namtchylak on Cargo Collective: Some writings and photographs by Sainkho Namtchylak that are not available on her official website. In the way that opera paints legends of human emotions and trials, Tuva’s palette of throat singing can vividly portray the drama of the earth. The movement of each sound and the strength with which it is delivered is often a creative interpretation of animals, elements, and landscapes, acting as a human continuation of nature. Choduraa Tumat, of Tuva’s only all-female throat singing band, Tyva Kyzy, draws the natural parallels between throat singing and its worldly inspiration. “Not only [in] khoomei, but some further vocal techniques of other cultures have originated in ancient times from the search and imitation by humans of the sounds of nature: the gusts of the wind, rivers, the songs of birds, the babbling of a brook,” she says. These symbolic imitations however, are not always necessary or intentional. “Throat singing is a mimesis in the sense that the styles and sounds can be associated with a particular type of landscape [like] ‘Mountain Kargyraa’, but they are not necessarily a direct imitation of a particular sound in nature,” say members of the Alash Ensemble, an internationally-acclaimed traditional Tuvan band. Beyond the physical imagery, there is also a much deeper connection that is directed by the passion of performers. While Tuvan throat singing was traditionally performed solo and often in pastoral settings, contemporary performance has evolved to emphasize bands, audiences, and a stage. A talented throat singer may incorporate numerous styles, cascading from the Sygyt songbird warble to the hollow echo of Khoomei and the mesmerizing waterfalls of Borbangnadyr. Though Tuva is far from any of our planet’s oceans, the deep gnostic growl of Kargyraa resonates with an oceanic weight, as though each breath were pulled from the deepest trenches of our planet. Extreme emotional responses can be triggered by a gifted performer, and even those sounds that are unpleasant or even frightening to a Western aesthetic have their own significant powers. The term khoomei is often used in Tuvan and Russian to describe throat-singing in general, but it also refers to a specific style. Khoomei is performed in the mid-range, and because of its sometimes hollow sound, it can evoke wind or movement. Sygyt is a high-range style of throat-singing, which may sometimes be referred to as the “Clear Sound”. It is a great challenge to perform sygyt without producing undesirable lower harmonics. The powerful and intense style of kargyraa is identified by its low range. Comparison can be drawn with the chanting of Tibetan monks. Vowels form the foundation for kargyraa song, and because of its depth and fullness, this style can have immense effects on a listener. Borbangnadyr, more of an effect than a separate style, is easily recognized for its gurgling effect, where sound ripples like water. The natural association is obvious and can be heard generally in mid- to high- ranges. Sygyt sung with a borbangnadyr effect can very easily sound like a bird call. 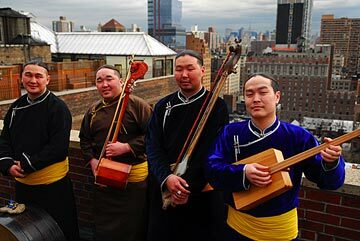 1 “About Tuvan Throat Singing”, Alash Ensemble. Retrieved 2013-04-16.